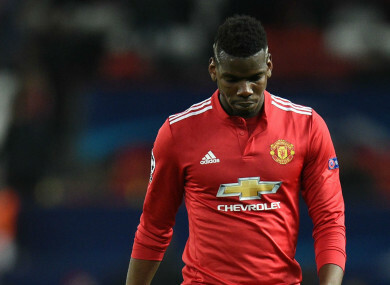 PAUL POGBA’S PROBLEMS at Manchester United have seen him compared to “a schoolboy” by Roy Keane, but the former captain sees issues at Old Trafford running deeper than the £89 million asset. The Red Devils crashed out of the Champions League at the last-16 stage on Tuesday, with a 2-1 defeat to Sevilla on home soil dashing their European dreams. Pogba had only been fit enough to start that game on the bench, but was introduced on the hour mark. He made little impact after joining the fold, with Keane adding his voice to those expressing concern at how ineffective United’s record signing has been over recent weeks. The Irishman told ITV: “Pogba is a big problem and if he can’t get in the starting 11 then you’re in trouble. You expect big players to come on and change the game. He came on and did nothing. We saw with the first goal, his reaction to it was like a schoolboy. “He doesn’t smell danger. The reason you’re part of a team is that when your team-mate makes a mistake, you cover for him and make up for it. Keane added on the Red Devils’ collective woes: “When I played for United I always thought when you put on the jersey you felt great, enjoyed the history, the pressure, the badge and expectation from supporters. “When I look at this team I get the impression they don’t enjoy the expectation and pressure. Jose Mourinho must shoulder some of the blame for tactical failings, but Keane believes the Portuguese does not have enough quality at his disposal and has made United willing to accept mediocrity. The former all-action midfielder, who won 12 major honours during his time with the Red Devils, said: “The manager will take responsibility. When you see him getting interviewed he’s not shocked. He works with them every day and knows they’re short of being one of the best teams in Europe. They need some more players, they’re three or four players short. Some of them aren’t good enough but it’s not their fault. If you get selected of course you’re going to play for United but they’re short and their record over the last three or four years will tell you that. Email “Roy Keane: 'Pogba is a big problem and if he can’t get in the starting 11 then you’re in trouble'”. Feedback on “Roy Keane: 'Pogba is a big problem and if he can’t get in the starting 11 then you’re in trouble'”.